Bitcoin Exchanges are becoming more popular among cryptocurrency users due to the demand. Buying and selling of cryptocurrency extremely simple by the cryptocurrency exchange platform. Today, without an exchange, it is not possible to buy, sell or exchange cryptocurrencies. Most of the traders searching the decentralized exchange platform to buy or sell the cryptocurrencies in a secured manner. So the demand for decentralized exchange platform is increasing than centralized cryptocurrency exchange platform. Exchange business owners depend on the Decentralized exchange script solution to develop their perfect decentralized exchange website. However, cryptocurrency exchanges often run into issues as the technology is evolving and not every cryptocurrency exchange script developer is deft in creating a flawless white label decentralized exchange software. What is White label decentralized exchange script? White label decentralized exchange software is emerging as a more efficient platform for not only the exchange owner but also for their users. 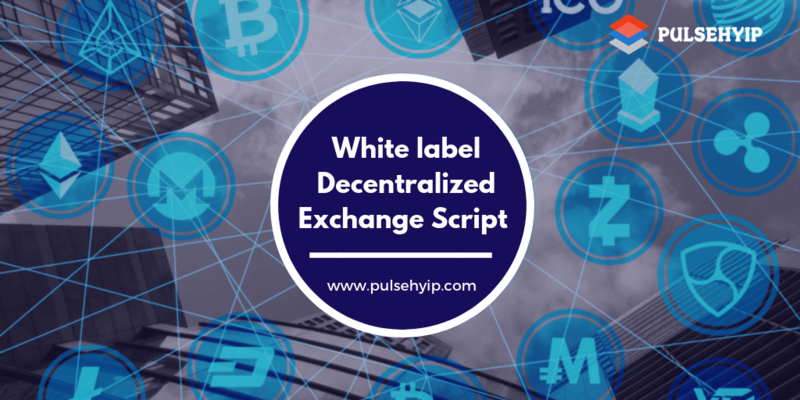 White label decentralized exchange script is software which is made by a Cryptocurrency exchange software development company and sold to its exchange business owners which would be the exchange itself. With the help of white label decentralized exchange script, the branding and small customization are done by the business owner itself. White label decentralized exchange software development is currently in a huge demand. It keeps the basic mechanism intact while letting the exchange owner make changes. It gives full rights to the owner itself to update the software according to the need. This is why this software is preferred everywhere. The ordinary bitcoin exchange script didn’t have this advantages, they are typically ready to use software allowed very less or no rights for customization. As Bitcoin and other cryptos are spreading through the markets, So the exchange business owners are required to be more prepared to face challenges. They have to be more updated and customized more than ever today. As a result, most of the exchange platform admins are now demanding their software to be a white label. There are many exchanges which are currently running on older software and are now updating their software with a white label. Pulsehyip is a Cryptocurrency Exchange Software Development Company in India( centralized and decentralized). We have empowered many crypto exchanges with white label exchange software that enhanced the efficiency and growth of the cryptocurrency exchange. We have made decentralized exchange software which the best examples of crypto exchanges till date. Our white label decentralized exchange script is capable of handling informal of data and, render the results with speed and accuracy. The pulsehyip team keeps itself up-to-date and we equip the software with the new updates as soon as they are released. We develop the bug-free decentralized exchange solution by deploying error-detecting applications at various levels in the software. We have never missed a deadline and each software that we have delivered has lived up to the expectations of our valuable clients. Get a Free Demo of white label decentralized exchange script!